Portrait of Harry Price in later life. 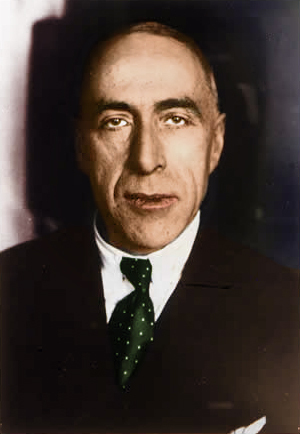 Harry Price was one of the most well known psychical researchers of his time. In the 1930s & 1940s, no newspaper or magazine article about an alleged case of haunting or a radio broadcast concerning poltergeists or the supernatural was complete without a contribution from Price. He himself was a prolific and talented writer and journalist, producing dozens of articles & several best selling books. A conjuror, engineer, photographer & numismatist, he carried out sittings with countless mediums, investigated all manner of haunted places, founded his own National Laboratory for the scientific examination of psychic phenomena & amassed the greatest collection of occult & magical literature which is still consulted by students & researchers to this day in a career which spanned over four decades & took him all over the world. Although his position in the history of British psychical research is well established, Price was a controversial figure in his day & this controversy continues to the present time as in the years following his death he has been accused amongst other things of fraud and deception in several of his investigations and in his most famous case in particular, the haunting of Borley Rectory, known as 'The Most Haunted House in England'. The purpose of this website is to provide a resource of information on the Internet about Harry Price, his work and his life and times. The intention is to include amongst other things a biography of Price as well as the people that worked with or were associated with him, a chronology of his life, studies of his cases & his writings and a bibliography of his published works. As well as documenting the past, it is also hoped to be able to contribute to our further knowledge of Harry Price by publishing new & original articles on his work and the investigations he was involved with. Contributions to this website by visitors are welcomed. Please e-mail mail@harrypricewebsite.co.uk with any enquiries including 'Harry Price' in the title. Please note, the former harryprice.co.uk domain is no longer connected with this website. Sixty years after Harry Price’s death, a major new book on the Borley Rectory case has been published. Written by Paul Adams and Eddie Brazil, the creators of this website, together with Peter Underwood, the UK's leading ghost hunter and author of over forty books on the occult and the paranormal, the Borley Rectory Companion is the most comprehensive reference work ever compiled on Price's most famous investigation. Interwoven between the reports of earthbound spirits, apparitions, poltergeist phenomena, ghost hunting vigils and séances is a human drama almost as remarkable as the paranormal happenings alleged to have occurred at the lonely Essex rectory.